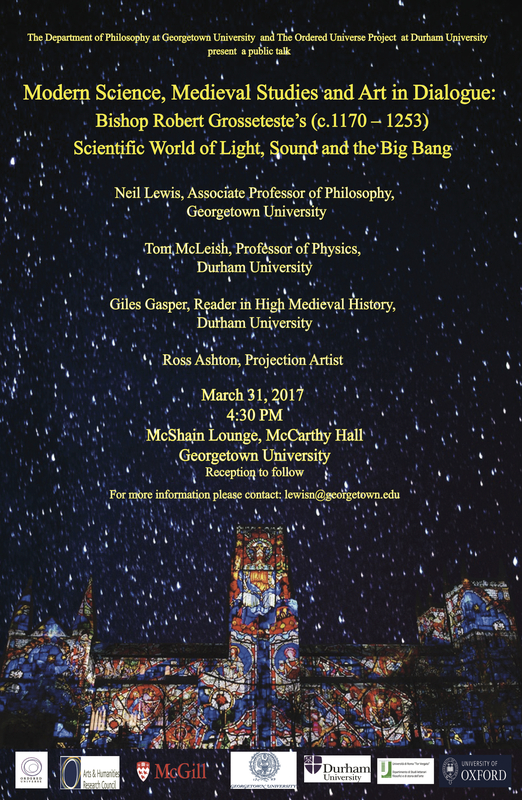 Through the kind offices of the Georgetown University Department of Philosophy, the Ordered Universe project will be holding a conference in late March 2017. This will explore the notions of understanding and feeling through the lens of Robert Grosseteste’s philosophical, scientific, and theological works. Grosseteste treats these notions in terms of a conception of the aspectus and affectus of the soul, a signature distinction employed throughout his career. Even so, these terms have longer histories of use and interpretation in the Middle Ages in both philosophy and spiritual contexts. The conference will be interdisciplinary in nature and feature papers from a wide range of disciplines, with international speakers, on the various themes raised by consideration of aspectus and affectus. Papers consider other uses of the terms in philosophical accounts of how the human mind works and in twelfth-century monastic writing, the inheritance from St. Augustine as used by Grosseteste in his treatise On the Liberal Arts, his collection of Dicta, and his Hexaemeron. Other fruitful avenues for exploring the implications of aspectus and affectus include medieval Arabic philosophy of science, and modern philosophy and science of perception and motivation. In addition to papers, the conference will devote a morning or afternoon session to a collaborative reading of Grosseteste’s treatise On the Liberal Arts, which is framed in terms of this distinction. The conference participants will include members of the Ordered Universe Project, as well as others working on its themes. This will feature of montage of films from the three sound and light shows inspired by Ordered Universe research and created by the Projection Studio’s Ross Ashton and Karen Monid.